My friend from Jerusalem is coming to visit me this summer. So, i asked him to bring me a Hatta / Kuffiyeh (حطة / كوفية) with him. Kuffiyas are traditionally worn in almost all of the Middle East. They are warm, comfy, and they look good too. So naturally, when i came to the states to study, i brought one with me to keep me warm during the long winter, and to affirm my identity. Anyway, my kuffiyeh is pretty worn out. So i asked my friend to bring me one with him. Being from Jerusalem, he is allowed to travel from the Ben Gurion airport in Tel-Aviv, and so he did. If you don’t know, Arabs (even Israeli Arabs) are treated to extra searches in that airport, and every item and every bag is inspected at least twice by hand. 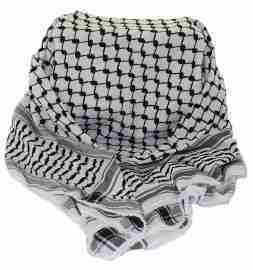 So unfortunately, when they saw the kuffiyeh, they decided it was too dangerous to carry on the plane (even though it is just a piece of cloth) and they took it away. I didn’t know that they would do that, but then again, should i be surprised ?! I don’t think so. 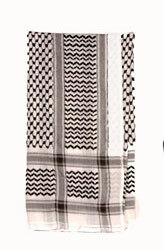 Ahh .. so now it seems i will be stuck with my old kuffiyeh. At least it could stand as a testament to the Israeli war on clothing. Anything that symbolizes who we are traditionally, religiously, and historically is a threat to them! I am surprised to read that they took a little piece of scarf!! It is so strange. Hope your friend will never give up and try for next time to bring with him the kufia. :) Never letting the israelis to keep control over us once. that’s just retarded on their part. Rebellious Arab Girl: Yup. It seems like it. Garfan: It is not about that piece of cloth. I know i could have bought one over the internet or from Arabic stores in the states. The idea is that i wanted something i got from Palestine. It has higher sentimental value to me if i bought it from Palestine. It is the same thing with hand-made things. Also, regardless of whether i could buy it from here or not .. the whole concept that they would confiscate a piece of cloth is just ridiculous. Mona: Yeah they do that. Also, going through Ben Gurion airport is a tremendous hassle if you are an Arab, and specially of Palestinian origin. My American friend who comes from a Palestinian background also faces alot of trouble and interrogation whenever he goes through ben gurion. 7aki Fadi: Indeed. But are really not to expect that ?! Still .. that does not make it any less retarded. It is just a piece of cloth for god’s sake. Falasteenyia: I know what you mean exactly. It is just a piece of cloth !!! and you can get it everywhere !!! Wear Your Kaffiyeh With Pride Day – Friday June 6th. 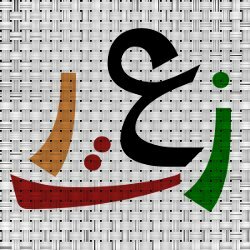 iMuslim: Thanks. This is a great event. I’m in. I have added the banner to my site. KJ: Thanks, ما تغلب حالك, i can buy a kuffiyeh here in the states. However, my problem is that it is just ridiculous that the Israeli authorities would object to, and confiscate, a piece of cloth.